Erected by Alexander Mackay tailor Lybster in memory of his beloved wife. Mary Brown died 11th November 1875 aged 45. Sacred to the memory of our dear parents. Alexander Mackay died at Lybster 7th April 1913 aged 84. 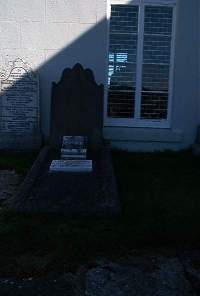 Wife Mary Mackay died at Lybster 26th August 1936 aged 85. Helen Coles Mackay born 1912 died 1986. Devoted mother of Leslie and Muriel. Husband Leslie Fraser born 1913 died 2000. With her at rest here.